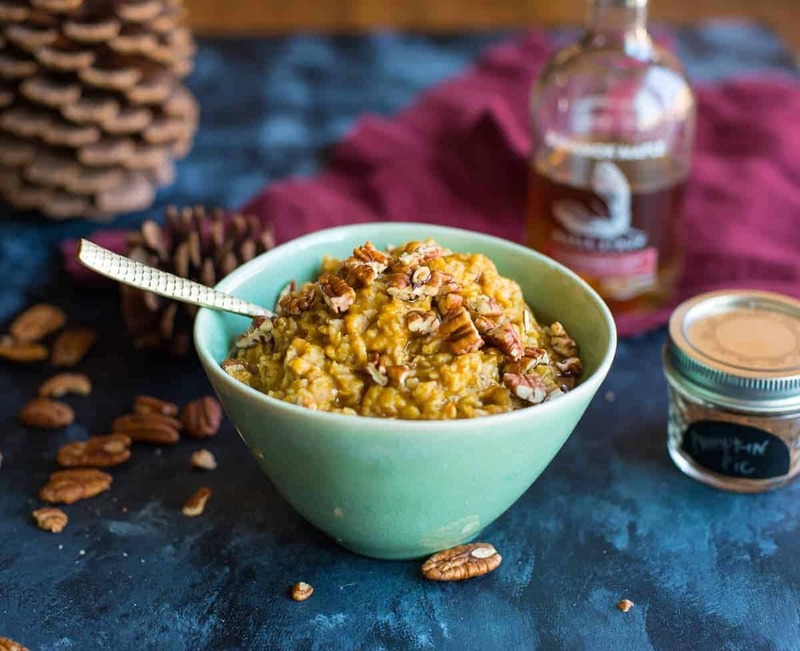 There is nothing like a warm bowl of these maple pumpkin spiced oats to get you in the mood for crisper weather. This bowl of warm pumpkin-spiced deliciousness is vegan and gluten-free. 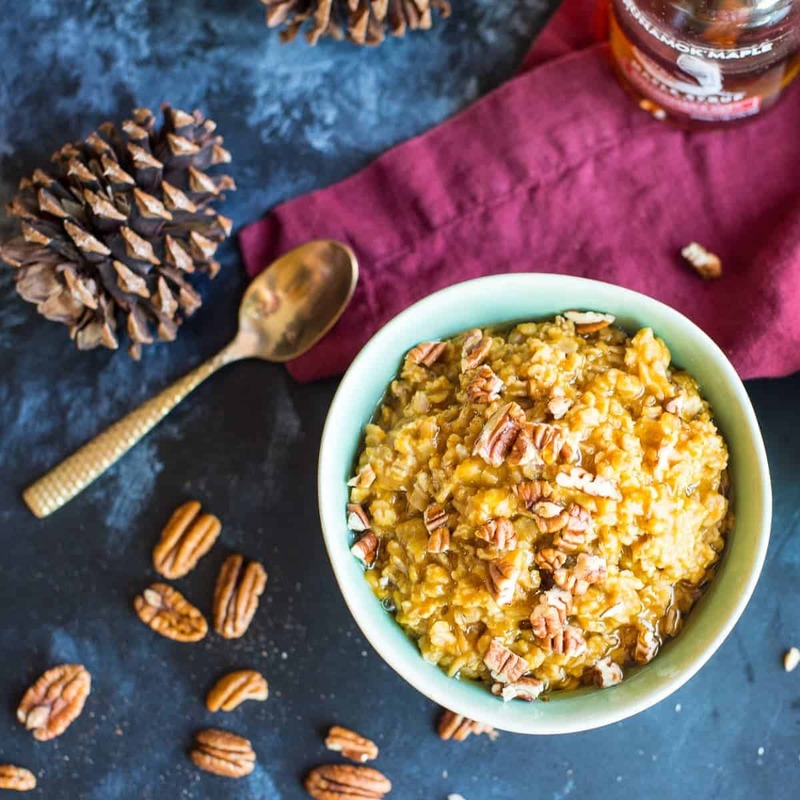 Make a batch of these allergy friendly pumpkin spice oats and eat them all week for breakfast! Vegan and gluten free, this healthy bowl of tasty oatmeal is perfect when you have holiday guests. After working on my Pumpkin Pie Tarts (that will be on the blog later this Fall), I had some extra pumpkin puree left over. I really hate to waste food. Being a food blogger there is a lot of cooking that happens – and a lot of leftovers. I am always trying to find ways to use up anything that I can. These oats were the perfect vehicle for my leftover pumpkin puree. As I was making them it occurred to me that this recipe would also work well in a slow cooker. With holidays coming and family in town, it is great to be able to make something easy that doesn’t leave you trapped in the kitchen. Imagine how good it would smell, too! I haven’t tried these in an Insta-pot yet but I would love to hear if anyone does try these in theirs. If you do leave a comment below and let us know. I recently fell in love with Runamok maple syrup. I topped my maple pumpkin spiced oats with a few roasted pecans and a little extra real maple syrup. I’ve always wanted to share my love of cooking with the people around me. Over the years I’d started to blog a few times but just couldn’t find the inspiration to keep at it. This time I just went all-in. I decided that if I totally failed there were only going to be maybe 2 followers as witnesses. I could handle that. In this year, I’ve learned so much and am only hoping to get better. I hope you will stick around and see what my second year brings. In the meantime – check out my other pumpkin recipes: buttermilk pumpkin donuts and the most amazing pumpkin spice soup. And if you feel inspired make sure to sign up for our emails and get our latest downloadables. Right now my pumpkin spice mix along with 4 other of my favorite go to spices are FREE when you sign up. Full of Fall flavor. These oats are vegan, gluten-free and you can also make them in your slow- cooker. Bring water, salt, and pumpkin puree to boil in a medium saucepan. Add oats, return to a boil, then reduce heat to simmer. Add pumpkin pie spice, maple syrup, and coconut milk. Simmer for about 10 minutes, stirring occasionnaly until liquid is absorbed and oats are desired tenderness. Serve and top with you desired toppings. Slow cooker for a crowd: These can made in a slow cooker. If you are cooking for a crowd. Double or triple the recipe. Add all ingredients to a slow cooker and then cook on low for 2 hours. Tips- cook the night before and just reheat in the morning on low.